Many of you replied to my last email about what you struggle with and I read every single reply. Thank you so much for taking time to do that. Whew! It was a lot of email to read, but so insightful! I sent an email like this several years ago, but haven’t done it since. Pat Flynn recently did this with his list, and it reminded me of how useful this exercise really is. It’s such a simple, yet effective strategy that not only reminds your subscribers you are here for them, but it also helps you ensure you are publishing content and products that are helpful. 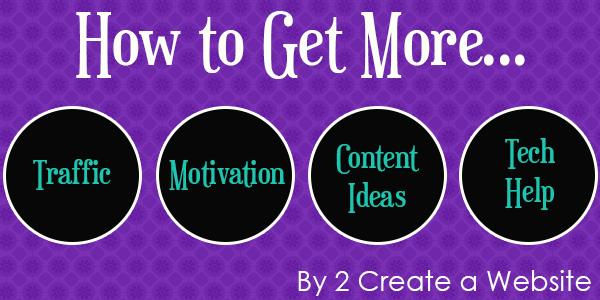 So I’m going to address the four most popular responses which pertain to motivation, traffic, content ideas and technical help. Many of you replied and said you just don’t have the motivation to keep going. You start out feeling hyped and energized, but it doesn’t last. Maybe you thought the desire to make money would be enough to keep you going. That works for a moment, but it gets old when failure sets in or your expectations aren’t met. I don’t believe the desire to make money is enough for most people. If it was, almost everyone who wanted to make money online would be doing so. Yes, money can be part of your motivation, but you need to find something else because 95% of people who set out to make money online don’t see success immediately. So what is going to keep you going while you find your way? You need SOMETHING to keep you motivated. And if you’re beating yourself up for not having the success you desire yet, STOP! You’re actually in the majority. People who get it right the first time are in the extreme minority. Have you ever listened to a podcast or interview of someone who is successful online? Did you notice how most discuss how many failures they had before the succeeded? Believe it or not those failures are gifts because they cause you to keep going back to the drawing board until you find something that sticks. 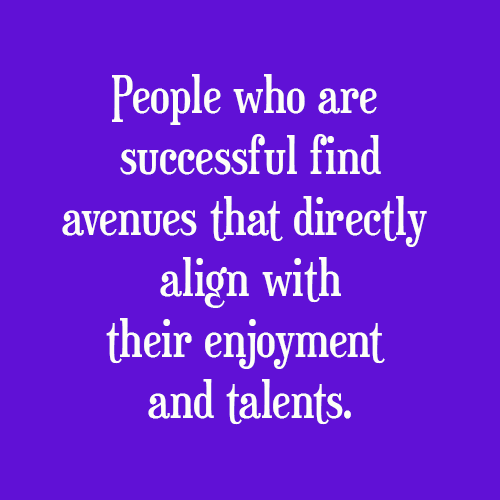 I’ve said this before, but I still believe that people who are successful find avenues that directly align with their enjoyment and talents. Why are you trying to become a top blogger when you hate to write? Why are you trying to tell people how to make money online with an MLM program when you don’t really like MLM and aren’t even succeeding with the program yourself? Do you see how inauthentic that is? That can’t be fun or motivating at all! And if you’re saying to yourself that what you enjoy can’t lead to income, I would beg to differ. You’d be surprised at how many different ways people are using the net to make money these days. 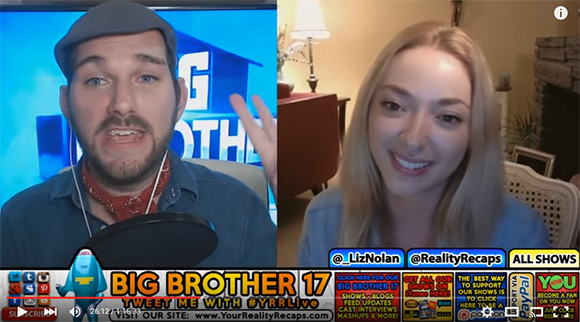 Eric, of YourRealityRecaps.com, is a huge reality show fan and uses YouNow (a free video chat service) to conduct live interviews and then he uploads those recordings to YouTube. Eric harnessed the power of social media (tweeting about and during the shows) to build up his following. His site, podcast and videos have become so popular that he now lands interviews from actual contestants on the reality shows! Eric provides exclusive content and interviews to those who sponsor him through Patreon. Currently the Patreon sponsorship brings in about $800/month. He also takes PayPal donations. This is a great example of an everyday person who is using something he enjoys, his talents (interviewing & presenting on video) and his passion (reality TV) to make money online. Often times the lack of motivation means you aren’t using your talents and what you love to fuel your journey. Find what makes YOU tick. And for goodness sakes, stop forcing yourself to master something you don’t even like doing! There is a misalignment here that’s demotivating the crap out of you! So you’re already starting out on the wrong foot. I know some people won’t agree with this, but I think many of you need to forget about making money for now and just get online and do something fun. So many successful businesses start out with the person just casually doing something they enjoy. Over time, you’ll discover what your audience likes, needs, what’s missing in the market and before you know it… you’re building a business! Listen to at least 3 podcasts that feature someone who is successful online. Start with The Smart Passive Income podcast, Entrepreneur on Fire and Unmistakable Creative. All feature people who are successful in many different niches and with different kinds of sites. These interviews are extremely motivating because you see success comes in many different forms and avenues. Go to Meetup.com and look for meetups in your area on entrepreneurship, blogging or whatever you want to do. Nah. I don’t belong to any club, but I’m a big believer in going to meetups to get fresh ideas and perspectives. That’s how I learned to make money with Facebook. Never thought I’d be doing this. The lack of traffic was the most popular response from you. 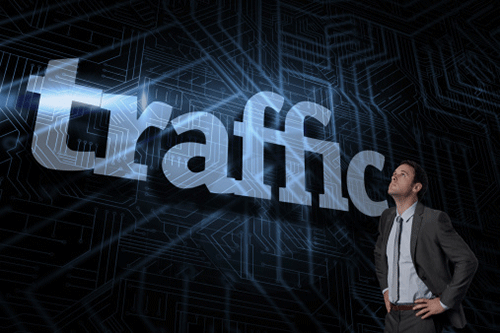 Google used to make getting traffic relatively easy, but times have changed. That’s OK. The good news is there are so many different options now. What’s ironic is that can also be a disadvantage because it’s overwhelming and you don’t know where to start. She has a health and wellness blog and uses Periscope to live stream at the same time every night during the week. She spends an hour answering questions and presenting helpful info about living a healthy lifestyle. The whole purpose of her “scope” is to promote her email list. At the end of every broadcast she tells people how to sign up. Since she started “scoping”, she has doubled the size of her email list and blog traffic. Danielle Ford is another blogger who uses Periscope regularly (she has over 7,000 followers) and then uploads her scopes to YouTube. 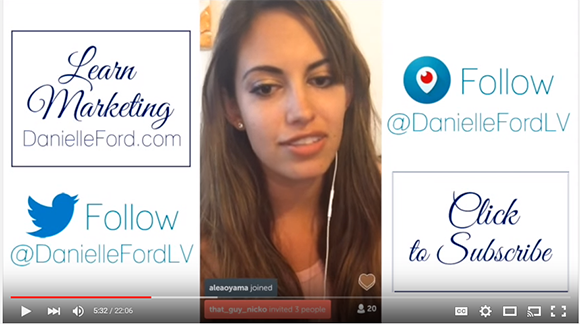 I love how she overlays her Periscope replay video onto a transparent PNG image and uses clickable annotations on YouTube to promote her site and email list. Clever! Focus on one traffic method outside of SEO for two months. You’ve got to stop the obsession with trying to build your entire traffic stream with SEO. SEO has changed for good, and Google wants you to pay. That’s how they make money. It doesn’t mean you can’t get some free, organic traffic (here’s the only free guide you’ll ever need), but it won’t be enough to build or sustain your business. I know you don’t want to hear that, but it’s real talk! Not to mention the record amount of passive income that has come from simply linking to my courses in the signature of my messages and autoresponder. I hate, hate, hate, hate that I ignored email for so long. But I’m sooooooooo glad I started over with my email list in 2011. The reason I suggest trying something for two months is it takes time to learn something and build up a rhythm. Just trying something once or twice is not enough to know if it’s going to work for you. Consistency is key. I wish I could tell you that building traffic is about doing something once or twice and then your traffic will take off, but it doesn’t work like that. It’s a marathon, not a sprint — meaning it takes time and it’s an ongoing process. So commit to one new thing for the next couple of months and see what happens! I actually have the opposite problem on this blog. Sometimes I have so many ideas, I don’t know which one to write about next. You should see my Drafts section in WordPress! It’s flooded with notes and post ideas. For a long time I could not relate to those of you who said you didn’t know what to write about. That seemed like such an odd problem to have. …until it happened to me!! You may remember that niche experiment that I refer to every now and then. It peaked at 800 visits per day in January and I remember staring at the traffic graph wondering what the heck I was going to write about next. Gosh, I was bored to tears. Because I tend to enjoy creating sites that teach others, I have to be active in the topic regularly and learning something new all the time — otherwise the well of ideas will run dry very quickly. I like adding my own experiences in my content. If I don’t have that to fall back on, the content starts to read like Wikipedia. The topic in the experiment was something I had mastered in my personal life, but I was not learning anything new anymore. Therefore I had nothing else to write about. I get content ideas for this blog by reading other blogs, trying something new or learning new things. And when you pick a topic that allows you to do that, you’ll never run out of things to write about. You can also do what I did with my email list. Ask your audience what they struggle with? Thanks to your replies, I’ll have content ideas for the next several months! BuzzSumo is a great resource for discovering content ideas. Simply type in a keyword and view the most popular content for that phrase. Use it to get ideas for what to write about. 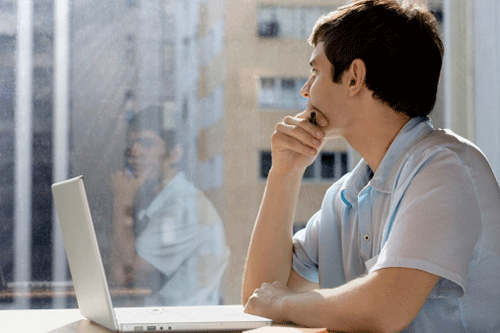 Ask yourself why you chose the topic of your website and answer honestly. Was it only income potential? Are you copying someone else who is already successful in that space? Can you see yourself talking about this topic months from now? If not, pick another one! If you chose a topic because of your experience, write down 10 personal experiences you’ve had in the niche over the past year. How can you turn at least one of those experiences into a blog post with a lesson for your audience? Content doesn’t always have to be of the how-to variety. Sometimes your most vulnerable posts about failures and struggles can be the most interesting. Adrienne Smith recently published a really fabulous post about using vulnerability to open up opportunities and improve engagement on your site. Is that an attention-grabbing sub-head or what? You’ve got to read this! You might THINK this is a big hindrance, but it doesn’t have to be. 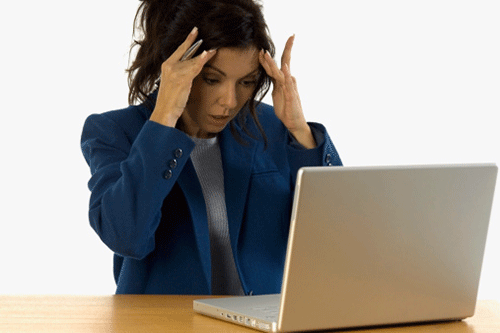 I’ve noticed that the lack of technical expertise often stops people in their tracks. Actually, most successful people online aren’t that technically savvy. They hire people to do what they can’t do, and you should too. If you hire someone to setup your site, you should still learn how to do the basics of site management. I’ve heard too many stories of people paying someone to setup and manage their site, only to have the person disappear off the face of the earth. As a result, they have no idea how to even access their site, much less update it. As you may know, if you host your site at Website Palace, I provide a free, 27 minute video on setting up your site with WordPress. Trust me. If you can move a mouse and type, you can build your site with WordPress. Stop letting your lack of technical skills prevent you from moving forward. Introduce yourself to Upwork. I use them all the time for various tasks — including the ever-so-tedious task of transcribing my podcasts. I just used them this weekend for a coding issue I had no time to figure out myself. What I love about this site is you are never obligated to hire anyone. You can submit your job request just to get an idea for what it should cost and communicate with available freelancers. Be very, very detailed with what you need done, and ask the applicants questions using the messaging feature built into Upwork. Pay attention to how quickly and thoroughly they respond. Read their recent ratings to get an idea of how proficient they are. If you’re hiring someone for web design, always ask for a portfolio (fortunately UpWork now has a feature where applicants can attach them). Don’t accept any jobs until you have several (at least 15) applicants. The more the better so you can get a better idea of what it should cost. Don’t always go with the cheapest quote! It’s tempting, I know, but consider the experience and feedback. Some people are worth the extra $10 or $20. Fiverr can also be a good resource to get things done cheaply, but just be careful. It’s very hit or miss. Also because it’s so cheap, a lot of the people use templates so you end up paying for something that is unoriginal. This is not the last time I’m going to address your replies. In fact, they are still coming in! If I didn’t mention what you struggle with and there are others with that same problem, I’ll probably write individual posts on those topics later on. I really do want to thank those of you who took time to answer. I can’t tell you how invaluable that exercise was. My head is literally spinning with content and video ideas. And if you asked a very unique question, I am going through some of them and answering individually. I obviously can’t answer everyone’s email, but I’m doing my best to work through some. I hope this post provided some insight, help and motivation. As always, your positive words coming from your heart always motivate me and makes me feel better. Hey Lisa, thanks for suggesting buzzsumo. I always of have problems of content ideas. I will try this one. I hope I can create more content with this one. First time commenting here, but Following Lisa for a while. I like her posts and writing to the point, I even linked lately to one of your articles in my blog 🙂 thank you. Thanks Lisa, you are a MIRACLE WORKER, it came when i needed it. Great post Lisa .In My point of view content is most importance factor. But with the help of this article I came to know well how to plan and take care of all the things. Came to the right spot when i was missing my blogging mojo. This post answered all my doubts. 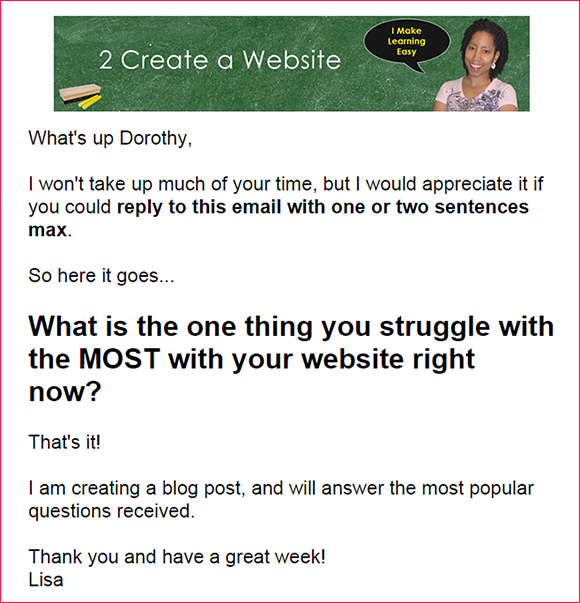 Well done and thanks Lisa, this really made up my mind very well in getting free traffic. I will focus on my homework. All the suggestions you teach are really helpful! I think I need to subscribe your blog for more interesting and informative class. This was a great idea to see who’s struggling and have questions with your list. I find it quite helpful, especially for the fact that you have a lot of experience. You were one of the few online marketers I discovered 5 years ago and influenced me to start online marketing. It’s definitely a learning and sometimes we can be left stagnant and confused to keep progressing. This is why it’s a great benefit for all of us to have someone like you to answer some of our most irksome questions. Thanks for sharing Lisa! Have a great Halloween weekend! Sherman, I really appreciate you always stopping by and sharing my content. Thank you for your continued support over the years. It’s hard to find someone who is competent in everything. 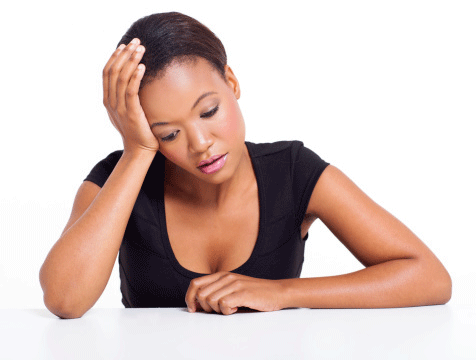 We all have some kind of fear, worry, or lack of ability to do certain things well. You address the struggles and provided good examples. Trust me I get it! We all deal with it at some level. I wish you all the best. What an awesome post and bravo for answering the most pressing questions from you list. I admire how you did this and the suggestions that you gave. Oh and thank you SO much for including Lorraine’s guest post from my blog. This was a topic I had intended to address but let’s face it, her experiences way overpowered mine. I’m definitely going to share your post because I know there are so many others who are having these same issues. It’s just so generous of you to put it here instead of addressing them as a whole. You’re the best. Thank you Adrienne! I loved that. I’ve found that my more vulnerable posts where I share what I struggled with resonate the most so I was so glad to see you write about that. I also read about your upcoming webinars! I’m so happy for you. I know you will do great. 🙂 Good luck! You’re welcome Kelara! Thank you for coming by. Your post was VERY helpful. It definitely responded to my issue about traffic but you also helped with problems that I didn’t realise that I had! Thanks. BTW, I do want to know if you have any information/insight/advice about operating two websites or how to merge two websites into one. Thanks again for responding. Looking forward to more great advice! Thanks Lisa for this motivating post. Eventhough I have abandoned my site; http://www.techandapps.com as I mentioned in my reply to the email you sent. I have decided I will be coming back online via http://www.onlinedomination.xyz where I will focus on how to create websites and blogs and how to get the best out of same through internet marketing. I hope to succeed on this. I enjoy reading you Blog very much and waiting for your next posts. I am currently doing my first steps as a Travel Blogger on my website TravelionX.com so i can relate to the content and traffic issues. A great website with interesting content material, that is what I need. I knew when you sent that email asking for the things people struggle with you would provide answer’s that meet our needs. Thanks for always providing insightful Lisa. Awww thanks so much. Means a lot, Tony! Loved this post, Lisa! Coming back into the blogging world after a period of absence, I appreciate your updated info. Since tech issues were what frustrated me the last time, I’m hiring out several tasks to alleviate this. Didn’t know about Upwork until now.Thanks you for an extremely relevant and informational post. Have a wonderful day! Welcome back to blogging, Stacey! Glad you found this helpful. Thanks for all the suggestions! They came at just the right time, especially in regard to the SEO issues. I still tend to get hung up on that!